"The shaman acts as intermediary between the world of men and the gods, and has the power to descend into the realms of the dead. His spirit is believed to journey forth from his body, which remains in a state of trance. Sometime the long journey which it takes is described by him in a chant. Sometimes he induces the conditions of ecstasy by beating his drum or by an elaborate and exciting dance" (118). In more complex agricultural societies, shamans are replaced by priests. Instead of going on an individual vision quest, the priest presides over communal rituals. In agricultural societies, a religious trance is usually interpreted as possession by a god or spirit, while in hunter-gatherer societies the trance is vehicle for the shaman's soul or spirit to leave his or her body and go on a spirit-journey (Clottes 26). Clottes, Jean, and David Lewis-Williams. 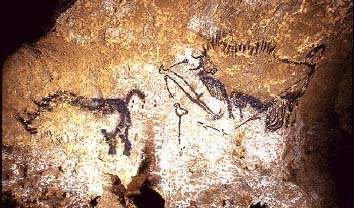 The Shamans of Prehistory: Trance and Magic in the Painted Caves. Trans. Sophie Hawkes. New York: Abrams, 1998. Davidson, H[ilda] R. Ellis. Gods and Myths of Northern Europe. New York: Penguin, 1964. Leeming, David Adams and Jake Page. God: Myths of the Male Divine. New York: Oxford UP, 1996. For a report on a contemporary shaman in the Amazon visit the PBS Nova page called "The Last Shaman." An graduate student in anthropology at the University of Minnesota, Kevin Callahan, has put together a fun site on "Shamanism and Rock Art in Minnesota." There are many bizarre and flaky new age sites on shamanism. Perhaps the best (most reliable or least flaky) one is called "Core Shamanism"
This site features an introductory essay on shamanism called "All Life Is Connected: The Shaman's Journey"
A serious academic journal for the study of shamanism is at http://www.arts.u-szeged.hu/journal/shaman/shaman.html. No full-text articles are available, however.